Joel Sked: Hearts bagged two goals and earned a point earned at McDiarmid Park. 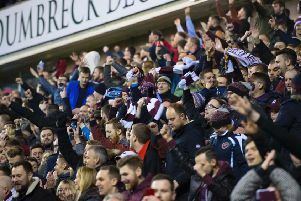 It suggested progress for a faltering Hearts side, but once again fans were left not only ruing poor decision making from the officials but also another disappointing all-round performance – collectively and individually. The team started well and did create openings in the first-half but offered very little after the interval. Confidence is fragile and there is a nervousness throughout the team. To keep the fans on side at Tynecastle, Hearts need a fast start with an early goal being hugely beneficial. Motherwell have their injury problems at the back, while Christophe Berra can stand up to their physical threat. Hearts to find their stride again and win 3-0. Anthony Brown: Given that it is at home to a side in the bottom four of the division, this looks to be Hearts’ most winnable fixture, on paper, since they last tasted victory away to Dundee in late October. Having banished their goal drought and welcomed Christophe Berra back into the side in the last two matches, they should have enough about them at both ends of the pitch to get back on the victory trail this weekend. Prediction: Home win. Mark Atkinson: Forget all the talk of referees and bad decisions – getting a point and two goals from an in-form St Johnstone was a good result. It provides a platform to build from and get the win against Motherwell. We all know Hearts are a much better side at Tynecastle, but they key to this game is that Motherwell are a good match-up for the Jambos. They tend to try and go toe-to-toe physically and play direct football – and that often doesn’t work at Tynecastle. The Steelmen will also miss Chris Cadden, Liam Donnelly and Peter Hartley. It won’t be pretty, but I think Hearts will edge this by the odd goal. Craig Fowler: While I completely agree with Joel’s take on the collective mentality of the Hearts squad at the moment, I’m not sure exactly where he’s getting an emphatic victory from. The squad is in too much of a malaise for that to happen, at least until they manage to ground out a win or two and Naismith returns. Problems in defence for Motherwell (Peter Hartley, Charles Dunne and Liam Donnelly could all be missing, while goalkeeper Trevor Carson is out for the season) should allow a weakened Hearts attack enough opportunities to eke this one out. Prediction: Narrow home win. Patrick McPartlin: Hearts ended their barren run in front of goal on Wednesday night against St Johnstone and could well have won the game had it not been for one of the most bizarre penalty calls we’re likely to see all season. While things seem to be heading in the right direction for Craig Levein’s side, there were still one or two iffy moments in Perth. That being said, a home match against a team whose away record is nothing to shout about (out of three away wins, two were against the bottom two sides) and who are struggling for fit defenders shouldn’t pose Hearts too many problems. Prediction: Home win. Neil McGlade: Hearts showed in patches of Wednesday’s night 2-2 stalemate in Perth that a win might not be too far around the corner. They might have taken all three points had it not been for a ludicrous decision from referee Andrew Dallas to award the hosts a penalty while the Jambos were 2-1 ahead. Motherwell picked up a point against champions Celtic and will be buoyed by their performance against the champions. But Hearts are back on the goal trail and will be too strong at home. Home win.